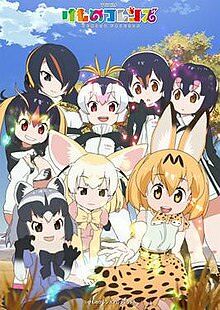 Kemono Friends is an anime I never really thought I would enjoy and watch fully from the first episode to the last, but after seeing all of the episodes, I’m glad I did. It’s now one of my favorite anime for many reasons. The story is surprisingly good. There is a girl that wakes up in a Savannah and doesn’t recall anything. She meets a Serval named Serval (naming scheme throughout anime). Serval calls the girl Kaban (Japanese for Bag) because of the bag she brought. She finds out that she is in Japari Park, and island filled with animals. Serval wants to help Kaban find out what type of animal she is by going to the library. Along the way, they meet many other anthropomorphic animals that help solve the mystery. This story is very good. It’s easy to digest and simple. It makes the anime a lot better than other anime. One small personal criticism however is their decision to use the name Kaban. It was a weird choice to name a character after a bag, but it’s not like other anime names are well thought out either. Ceruleans are very good antagonists because they always try to create trouble to the characters in interesting ways. They also present the audience with the question of, “What are they and how are they created?” throughout the story. This part of the anime is not good. They used CGI-type animation for this anime but because of the lack of a big budget, it wasn’t very good. They use 2D backgrounds on 3D animation, which looks a bit weird but you can get used to it after a while. The 2D backgrounds do look very good though. The first episode is where it really falls short, especially during the first few minutes of it. The first episode of any anime is what the audience uses to judge the anime, similar to a cover of a book, and if they don’t enjoy the first episode, they won’t watch it anymore, which is what happened. It does get better throughout the next few episodes because of the attention it received after episode 4. Some advice is that you shouldn’t judge an anime by your early impressions of it. It won’t open you up to an anime that you might actually love in the end. The audio is decent. The character’s voices are leveled and are easy to hear and comprehend. However, the educational parts of the anime (explained later in this review) don’t have the best audio. Some of them are actually recorded professionally (for example the Serval part in episode 1 and some of them are recorded from a phone call or in an area with some noise. You might find an issue with it in the anime music albums, but it isn’t an issue here. Lip-syncing is also less than decent as it doesn’t fit together with the voices. Thankfully it isn’t extremely out of order, but it looks very weird in the end. Going back to the voices, the voice actors portray the characters very well. Whenever they are supposed to be in shock or in sadness, they do it very well, making the anime seem very real. A criticism I have is with the background music. Whenever something dramatic happens, they play this song (Cerulean) and play it until the drop comes. It stops and something big happens to replace the drop of the song. I personally don’t like it as they do it every time. There is a lot of background music I love, but to cut it short my favorite one is Kawaii Nihiki since it has a good beat and sounds cute. In each episode, they introduce at least one new character, and explain them in the educational segments. Whenever there is a new character announced, the audience learns something about them. It’s unique and a cool addition to the anime. These character’s purpose is to help Kaban figure out what type of animal she is and to progress the story. These characters are all different types of animals. They are what makes Japari Park just that. They act like what an animal would, unaware of what many of the things there are in the park. They each have a different personality and it really makes the anime better. Kaban is a smart character in the anime. She usually solves situations, which helps them figure out what animal she is. Serval is a clumsy character that helps Kaban. Lucky Beast is another major character that adds a lot to the anime. This anime is on my top 5 best anime list. Why? This anime does a lot of things well, like the story and character. The things it doesn’t do well honestly makes it more memorable. What adds on to the anime’s greatness is the Reddit (aka the fan-base) and the album music. Kemono Friends has a very good fan-base on places like Reddit. It makes it better because they do a lot of things related to the anime like art. The albums the anime has (Japari Cafe, OST, etc) sound very good and add more content to the anime. However, like I explained in the Sound section of this review, the audio is not oftenly good (i.e. moved away from the mic too much). It’s doesn’t affect the experience though. Kemono Friends is an anime that gets a lot right and does the best it can with what it has. It’s story is in some ways unique and makes the anime great. The art/animation is cheap, seen from the first episode, but it does get better over time. The voice acting in the anime is good, but in other audio aspects its lacking. The characters in the anime are great as well because of how different they all are. In the end, If you like anime with some great story, mystery, and animals, this might be in your lane. You won’t be disappointed.